This Fitbit experiment has lots of fun and challenging! I’ve been learning a lot about the importance of community in this self-tracking adventure and how to work through failure even when I’ve supposedly set realistic goals. Okay, as I mentioned in my last update, I’ve seen a big benefit in having other people who I interact with on a daily basis also tracking their steps. 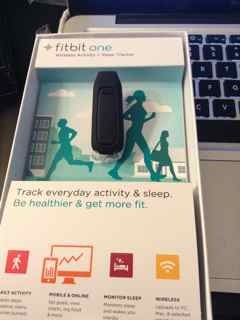 And I didn’t expect that my first post would inspire my friend Brittany to get a Fitbit One. But it did and since then we’ve had a lot of great discussions about our experiences. During our chats Brittany shared a tip with me that’s helped her in the early stages of her own Fitbit step challenge. For example, each day she tries to walk 100 more steps than she did the previous day. This is a great gradual approach to creating a new behavior, instead of trying to walk 10K steps a day right away. And I’ve actually incorporated this approach into my own challenge and it’s been working great. My daily average steps is right around 7,000 steps with the weekends being when I usually get over 10,000 steps because I’m doing more running and activity around the house or I’m out and about with family and friends. So my focus has been to look at my activity during the week and see where I can gradually add more steps and not sit too much or miss a morning or evening walk because I’m too tired or unmotivated. Speaking of motivation, I’ll also be honest and tell you that having friends like Brittany to share experiences with has been a huge factor in keeping on track and not getting discouraged if I don’t hit my daily goal. The other bonus of having a Fitbit buddy is that my competitive nature has turned out to keep me healthy because I get motivated to make sure that I get more steps than Brittany. It’s a friendly competition and Brittany’s excitement has inspired and challenged me many times these pasts couple months. That said, as of this post, Brittany has now been averaging 10K steps a day, and even better, my friend Jennifer has also been doing a great job at increasing her steps, and she is also averaging more steps than me for the last several weeks. Which brings me to my biggest learning moment yet. 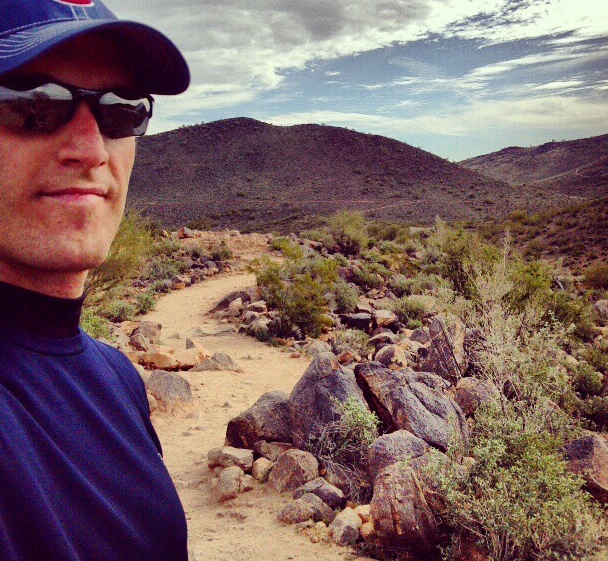 The last week of February I went to Arizona on vacation and I averaged 11,000 steps a day and had the chance to run on some really sweet trails like the one above. 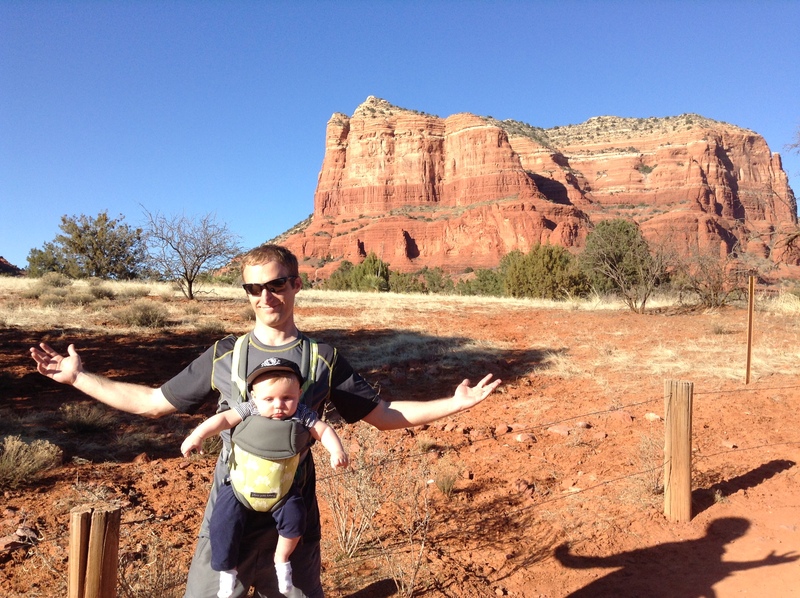 Of course, we did a lot of sight-seeing, including an amazing hike up Bell Rock Trail in Sedona. It was Calvin’s first trail hike and it was tons of fun as we all made our way up the trail and then cruised back down again. We were out and about for most of our 8-day trip so that really helped in getting above the 10k mark each day. But when I returned to work and the daily flow of my job, I really struggled to hit my pre-vacation average of 8,000 a day. I came back to a crazy work load and found myself in a lot of meetings and having to get caught up by sitting at my desk more than usual. And ever since it’s been a really struggle to get back on track, especially with the cold weather in Chicago. …you rely on your Fitbit buddies. Yes, that’s right. At several points during my experiment it’s been tough. But the one thing that has been a huge help and critical to keeping me going and getting back on track has been my Fitbit buddies Brittany and Jennifer. Everyday since I’ve been back from Arizona I’ve looked at the Fitbit leader boards and seen myself at the bottom of the weekly average. And in a weird way this has motivated me to get back to where I was before my trip to Arizona. Besides that, it’s also been inspiring to see both Brittany and Jennifer take off and increase their daily averages. And in my conversations with Brittany she’s shared some interesting, creative and entertaining details about how she’s raised her daily average. She explained to me that on certain days she has nightly Fitbit stepping challenges with her boyfriend Brad as they walk around their apartment trying to out step each other. I loved hearing at that story from Brittany because it’s both entertaining and encouraging to think when we share our Fitbit experiences with others and the benefits self-tracking have the power to inspired others to create that sort of positive and fun behavior change. And I’m looking forward to experiencing that with Colleen too. More on that in a moment. But one thing that I love the most about learning more about Brittany and Brad’s experience is that it’s not really about competition. In the end, for me, it’s about creating and fostering community. Having a mini Fitbit buddy community like the one I have with Brittany and Jennifer and the other Fitbit users is such a game-changer. And unfortunately, so many people try to do something like this by themselves and it doesn’t last or they don’t get a much out of it as they could. All of those functions are in good fun and have been things I both given and received during my experience and it’s been a blast doing so! A 2011 study published in Psychology of Sport and Exercise found that the exercise habits of people you know have a positive influence on your exercise habits. Another study, from the Department of Kinesiology at Indiana University, surveyed married couples who joined health clubs together and found that couples who worked out separately had a 43 percent dropout rate over the course of a year. Those who went to the gym together, regardless of whether they focused on the same type of exercise, had only a 6.3 percent dropout rate. So if you’re thinking of starting to do self-tracking or trying a similar Fitbit or other fitness personal challenge, I highly encourage you to find someone you know and ask them to join you in your quest. This is probably one of the most important things you can do when you’re starting out with self-tracking or trying to develop a new behavior to stay healthy. If you can’t find someone you know, you can always check out the Fitbit community. And just a quick note for those of you who primarily use the mobile app: You can only connect with the Fitbit community groups on the website login on the main navigation. I started this experiment with the Fitbit Ultra and in my first post I mentioned that one week later they discountined the Ultra and unveiled the One. So over the last several weeks, I was having some issues with my Ultra. It wasn’t tracking or syncing properly. I did all the necessary software updates and re-syncing but the issues still remained. During this process I emailed back and forth with Fitbit support and explained my situation and after I told them I had tried all the trouble-shooting suggestions, they very kindly sent me a new Fitbit One as a replacement. And I’d like to give big props to Fitbit and their support team for the great customer service. They were helpful and responded quickly in a way that took care of the problem and didn’t put a damper on our experiment. The One tracker arrived on Friday, and for the last few days I’ve been using the One and I love it! And I’ll be sure to share more about my One experience. I also ordered the new Flex for Colleen. The Flex doesn’t ship until the Spring and I’m looking forward to sharing some of her experiences too. That’s it for this update. And stay tuned for the next update as I share some stories about what I’ve learned about earndit and Walgreens newly revamped Steps program. I need more Fitbit buddies, and I’d love to hear more about your experiences too. Now, tell me how you’ve been using Fitbit to change your life. Hi Chris, great shared experience thanks.